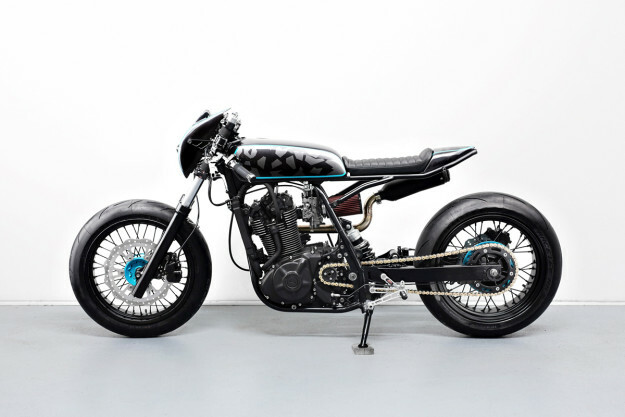 Since the scrambler is the style du jour, street bikes are being reconfigured as dirt-bikes on a daily basis. So it’s a rare treat to see a builder going in the opposite direction. Suzuki’s DR650 is true to the original scrambler spirit: it’s tall, robust and utilitarian. 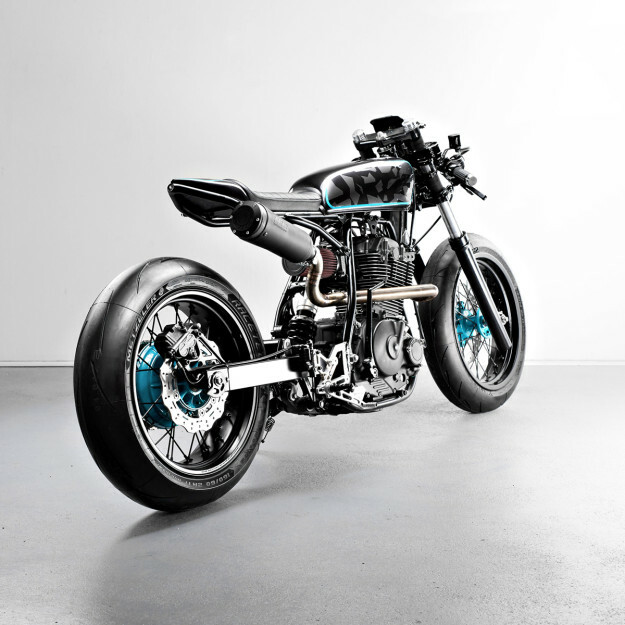 But to the boys at Munich-based Diamond Atelier, it’s a thumper begging to be urbanized. This 1992 model was the daily runner of Diamond Atelier co-founder Tom Konecny. But the workshop had already finished two BMWs and felt like a change, so onto the bench went the Suzuki. 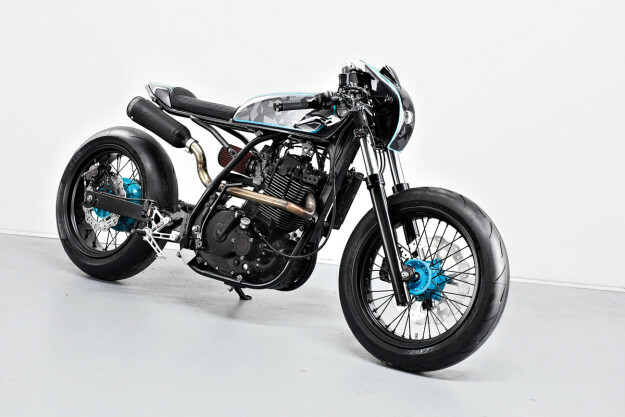 The lanky posture of the DR650 was a far cry from what the guys had in mind—so the project started with a complete tear down. Then a set of rare 17-inch race rims were laced to the stock hubs, to help get the stance just right. “The rims actually came from two complete sets of wheels, which we were looking for for over half a year,” says Tom. Next up was suspension. A new set of shorter-than-stock 41mm forks were built up with new internals, while the rear was treated to a modern sportbike shock. Performance tires were a logical choice, so a pair of Metzeler Racetec RRs was fitted. With the bike mocked up, it was clear that the frame needed more than just a cut-n-loop. 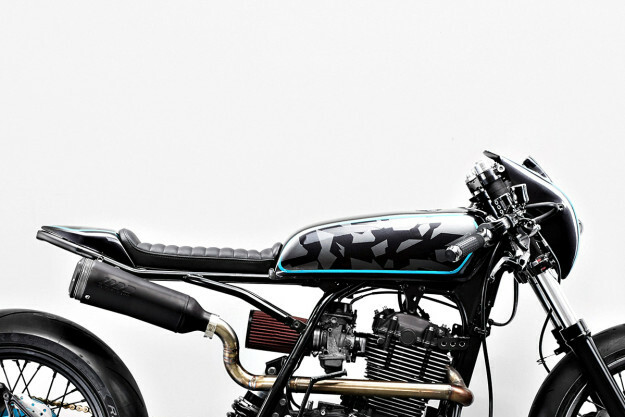 Instead, it was modified extensively to massage the old scrambler’s lines into shape. 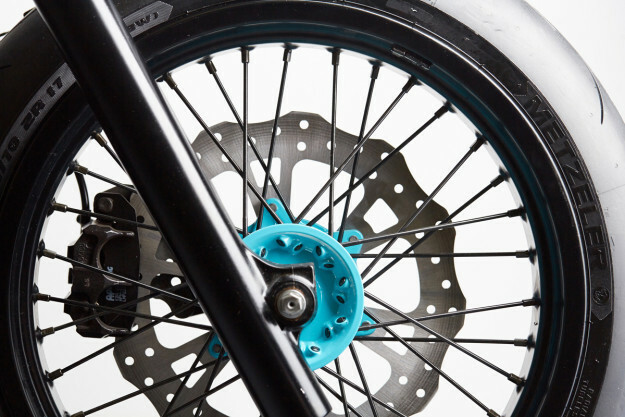 The subframe is all new too—with a sleek taper that ends with a discreet LED tail light. The bodywork’s a mix of second hand and made-from-scratch bits. The tank’s a 70s Honda unit, tweaked to fit—but the headlight shroud and tailpiece are new, shaped from 1mm sheet metal. Up top is a minimal cowhide seat. Keeping the bike as uncluttered as possible was high on the agenda. With no battery to contend with (this DR is kick start only), the biggest challenge was hiding all the wiring. Everything’s running through a Kellermann R3 control unit, discreetly hidden under the tank. 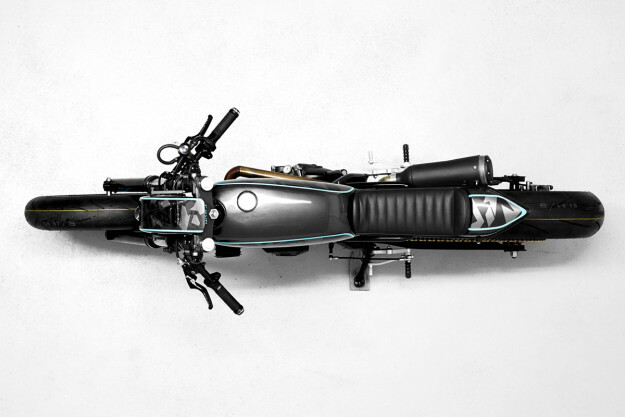 Diamond wanted to give the cockpit a racing slant, so they procured “all kinds of CNC-machined goodness” from specialists ABM. 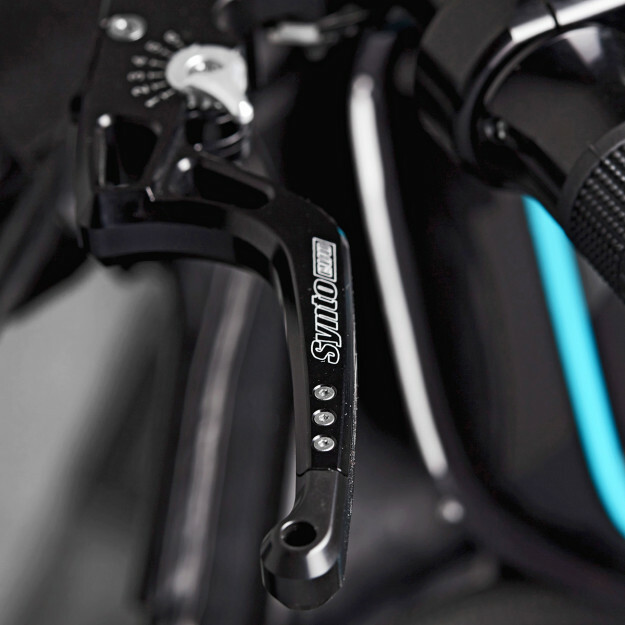 The list included clip-ons, levers, controls, grips and a set of rear-set pegs. Further upgrades include a modded Suzuki GSX-R master cylinder, with parts from a Yamaha YZR-1 added to the clutch setup. 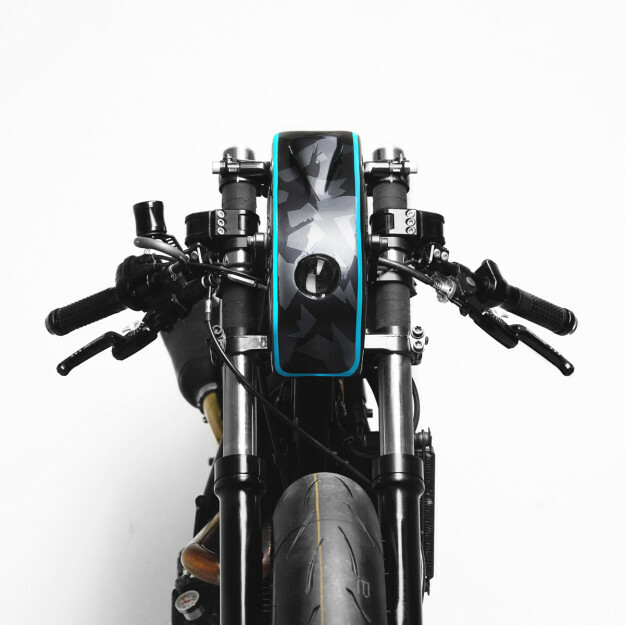 There are Motogadget turn signals on the bars and at the rear, and if you look really closely, you’ll see a tiny Motogadget LED speedo embedded in the cowl. The engine wasn’t neglected either. It was rebuilt from the ground up, and the carbs rejetted to work with the K&N filter and audacious Supertrapp muffler. The new header was fabricated in-house. 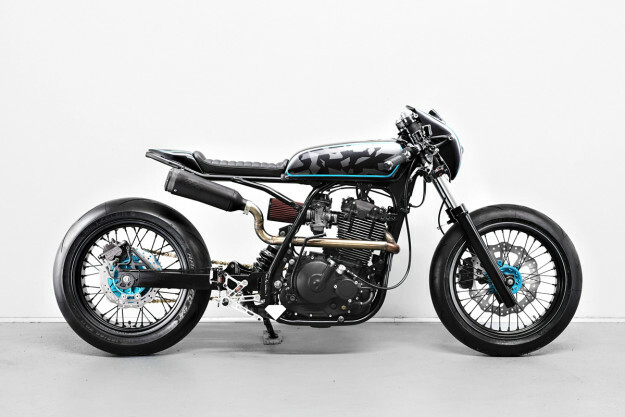 There’s no doubt that Diamond Atelier has nailed the stance and lines of this DR650—the bike looks single-minded and agile. But it’s the new livery that pushes it over the edge: a monochrome camo scheme—punctuated by bright blue accents—that was mixed and applied by hand. Diamond Atelier might be a young outfit, but they’re quickly carving out their own, neo-retro niche. If you like what you see, you’re in luck: DA#5 is available for sale.